It is now getting on for four long years since Dawn Landes last appeared in York. On that occasion, she was at Fibbers and I somehow doubt there was any more than 20 people there that cold January night. This evening, though, she is playing in the far more intimate surroundings of the Basement and there must be at least four times that number here in attendance. As these figures might suggest, much has changed in that time for the 37 year old American singer-songwriter and musician who is originally from Louisville, Kentucky. In late 2015 she was still touring Bluebird, a record released in February of the previous year and one that is widely regarded as her “divorce album” referencing as it does the breakup with her former husband, the singer Josh Ritter. Fast forward to the present day and Dawn Landes positively exudes happiness. She is re-married – her husband Creighton Irons accompanies her on this tour on keyboards – and the couple have a baby daughter. Landes skips onto the stage dressed in a white satin-fringed Western shirt, matching red boots and drainpipe jeans looking every inch a country and western star. 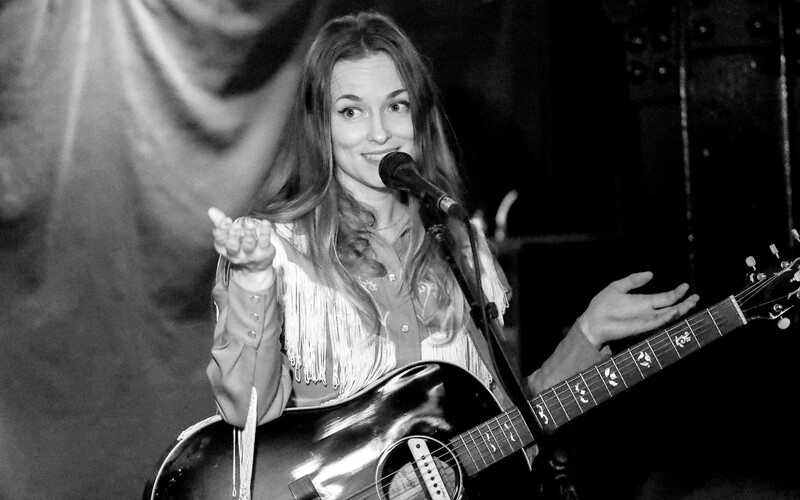 Dawn Landes’ physical appearance reflects the dramatic shift her music took for the follow-up to Bluebird, this year’s Meet Me at the River. Recorded in Nashville, Tennessee (and following her family’s relocation to Music City) it is Landes’ inspired take on classic country. She opens up here with ‘Wind and Rain’ from the new album playing alongside not only her husband but also Lail Arad (one half of support act JF Robitaille & Lail Arad) who adds some delightful counterpoint vocals to the song. That other old country staple of heartache is given an airing on ‘Try To Make A Fire Burn Again’. Taken from Bluebird and presumably referring to Dawn Landes’ then relationship with Josh Ritter her clear, almost matter-of-fact delivery measures the distance of just how far she has travelled emotionally since that difficult time. Another song from that album, ‘Bloodhound’ reminds us of Landes’ indie-folk/alt. pop past where the undiluted purity of her voice places her much closer to the Canadian songstress Anne Murray than does the greater country bent of her newer material which has her rubbing what are genuine vocal shoulders with the likes of Crystal Gayle and Linda Ronstadt.